Yuichiro Miura has an unusual routine for a man who just turned 75. Ask Miura why he isn't on the golf course or puttering around a vegetable garden, and he has a simple answer - Mount Everest. Miura is one of Japan's old men of the mountain, a small cluster of graying Japanese climbers who since 2002 have been passing among themselves an august title: the oldest person to have conquered the world's tallest peak. "It's a tough but wonderful thing to get to the peak when you are past 70," Miura said at his Tokyo home. "I hope to send the message that we have the potential for many things in this aging society." It's no wonder that the Japanese have cornered the market in elderly Everest conquerers. The country has the world's longest-living population and is going through a boom in activities for the elderly. "It feels like the goddess of Everest is beckoning me to come back," said Miura, who is planning an assault on the mountain next spring, when he'll be 75 (Edmund Hillary was 33 when he became the first man to climb Everest, in 1953). None of three other Japanese record-holders plans to scale the mountain, they say. "Overall, the elderly have more vitality than before and their performance in sports is also improving," said Takuji Shirasawa, a specialist on aging at the Tokyo Metropolitan Institute of Gerontology who consults Miura. The spread of commercial expeditions beginning in the early 1990's allowed inexperienced but rich climbers to reach the summit. 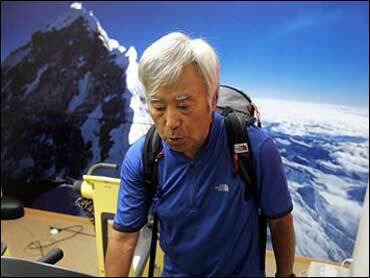 Arayama, who broke Miura's record when he scaled the peak in 2006, said climbing Everest was a remote idea in his 20s, when the science was undeveloped and the experience was not widely open to the general public. "The way we climb has changed. You use oxygen so you won't tire yourself, and more was found out about the best pace of climbing, and that's why I got to climb," he said. Miura's climb is estimated to cost around $1.7 million spanning three years to 2008, including overseas training trips and $515,000 for the May expedition, which includes expenses for his climbing companions as well as communication and video recording costs. The effort is supported by corporate giants including Toyota Corp. and Toshiba Corp. He's in excellent shape. A test before his 2003 climb showed him with the fitness of a 39-year-old man, according to Masayoshi Yamamoto, exercise physiology professor at the National Institute of Fitness and Sports in Kanoya in southwestern Japan. Miura isn't taking any chances. He has twice been treated in recent months for an irregular heartbeat. His son Gota will accompany him to Everest, as he did in 2003, and during the climb they will e-mail medical information such as his heart rates to doctors in Japan. Miura says setting a record isn't all that important, since someone else will surely come along and break it. Instead, he said, "It's about discovering what I can do."